Instead of focusing on bats, pumpkins and candy this Halloween, talk to your students about how they can make a difference! Not all children have the luxury of looking forward to collecting candy. Some children worry about having clean water, food, medicine and an education. 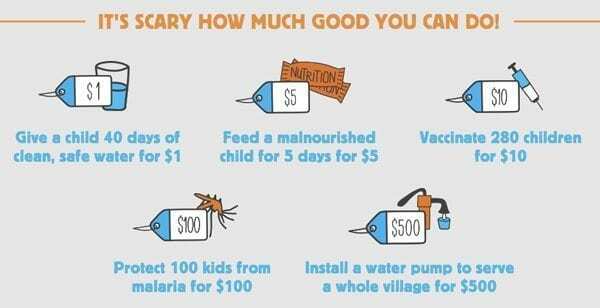 By Trick-or-Treating for UNICEF, your students can make a huge contribution. One dollar will give a child 40 days of clean, safe water. Five dollars will feed a malnourished child for five days. Ten dollars will provide 280 children with vaccinations. Any amount of money will make a difference. How can you tie Trick-or-Treat for UNICEF in with your curriculum and make it meaningful, fun and align with the Common Core Standards? Below you will find authentic ways to integrate it with all content areas (social studies, English language arts, math and science)! Did you know that you are all citizens? What does citizen mean? A citizen is a member of a community, country or group. All citizens have rights and responsibilities. We are citizens at local, national and global levels. Read the book: We Live Here Too! by Nancy Loewen. We discovered that all citizens have rights and responsibilities. What rights do we have as citizens? However, some individuals’ rights are not met. They do not have access to clean water, food, medicine or education. How does this affect you or me? Does it relate to me personally, to my community (local – family/school), or is it a national or global issue? 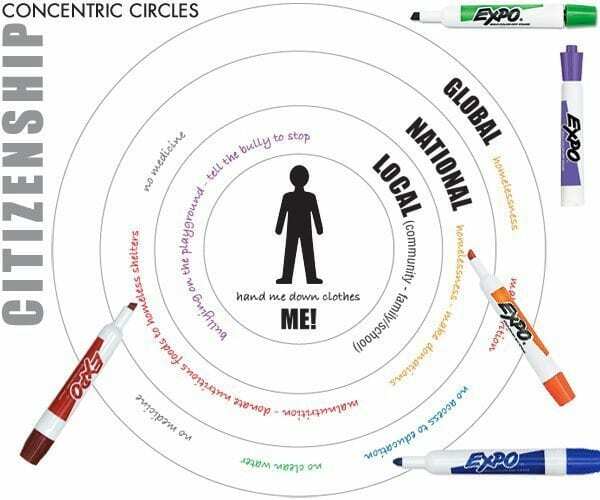 Project the concentric circle diagram from What Ed Said onto the board (or draw one: example below). 1. Bullying on the playground. 2. No access to clean water. 4. Wearing “hand-me-down” clothing and shoes. 5. Sick with no access to medicine. 7. No access to education. Discuss the students’ responses. Did some things fall into more than one category? Some things affect us at a local, national or global level. We belong to each of these levels. Good citizens are responsible. What are the responsibilities of good citizens? Set good examples for others. How? Have the students expand on this topic of citizenship. Say, “Looking at what we recorded on our ‘How Does It Affect Me?’ diagram, what would a good citizen do to solve the problem?” Write their solutions next to the scenarios. Knowing that we have rights and responsibilities, how can we help others whose rights are not afforded? Have the students brainstorm ideas. Then, watch the UNICEF video. Instead of just trick-or-treating for candy, we are all going to demonstrate our global citizenship by trick-or-treating for children who are in need. It doesn’t matter how old we are, anyone can make a difference! 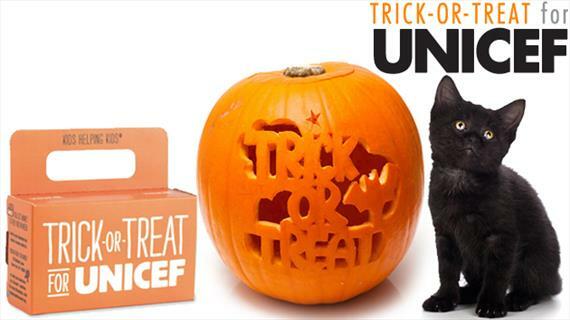 Explain to the students that they are going to create a special UNICEF trick-or-treat box to take around with them when they go trick-or-treating. When they go door-to-door collecting candy, they will tell people that they are demonstrating their global citizenship! They are collecting donations for children who need help. Register your class and download UNICEF materials for students to create their own boxes! 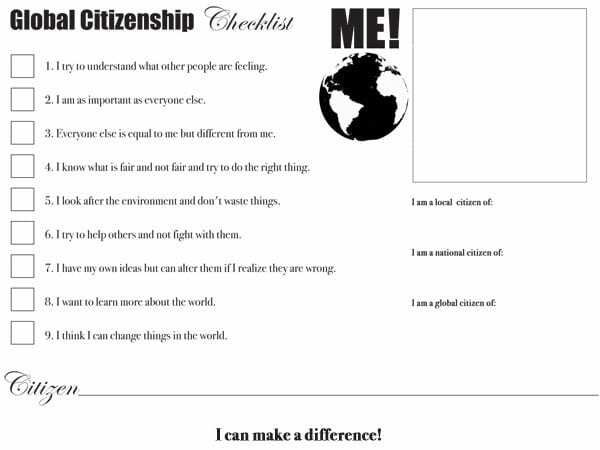 Afterwards, have the students fill out the Global Citizenship Checklist (inspired by Mary Young and Ellish Commin’s Global Citizenship: The Handbook for Primary Teaching). This will reinforce citizenship and its meaning to the students. 1. I try to understand what other people are feeling. 2. I am as important as everyone else. 3. Everyone else is equal to me but different from me. 4. I know what is fair and not fair and try to do the right thing. 5. I look after the environment and don’t waste things. 6. I try to help others and not fight with them. 7. I have my own ideas but can alter them if I realize they are wrong. 8. I want to learn more about the world. 9. I think I can change things in the world. Click Global Citizenship Checklist for the printable featured above. Students draw or paste a picture of themselves in the box after they check the boxes on the left. They are to research the topic and how it affects people in the country of their group’s choice. Afterwards, they create a digital poster using the tool Smore or Glogster. They could even create a slideshow in PhotoPeach if you do not have an account in the digital-poster creator tools. On their poster, have them include written facts in their own writing, images, links and videos. 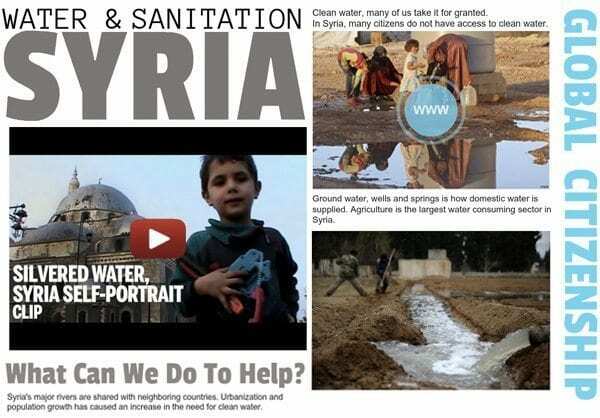 Above is an example of a digital poster made in Glogster about water and Syria. After students have collected donations on Halloween night, have them count up their money and graph the results! For homework, have students count how much candy they collected and compare it to the money they received in donations. They could figure out the amount of money their candy is worth. Practice place value by writing the total amount of donations you received. Talk about the number in each place value. Have the students write down the amount they collected in standard and expanded form. How many students collected an even number? How many collected an odd number? Afterwards, have the students figure out the area and perimeter of their boxes. Conduct an experiment to turn filthy water into clean water! Students use natural elements to filter water. Who can make the clearest water? 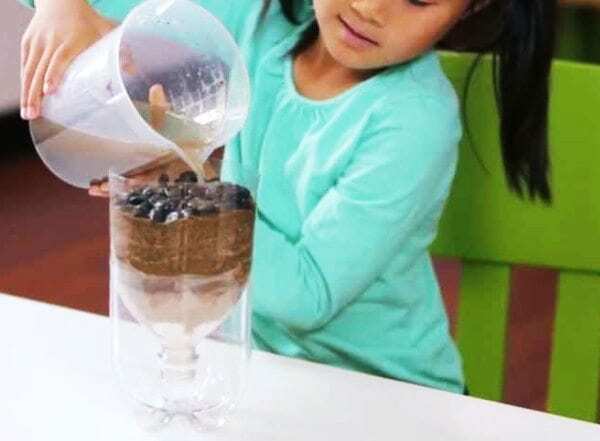 Check out this Eco-Friendly Water Filtration Activity for directions, or watch this video tutorial (featured above from Kiwi Crate). Note: Do not drink this water! You can use it to water your classroom plants. Erin Bittman is a second/third-grade student teacher in a multi-grade classroom at a themed Magnet School. She attends the University of Cincinnati. Check out her blog E Is for Explore! Check out my blog eisforexplore.blogspot.com!